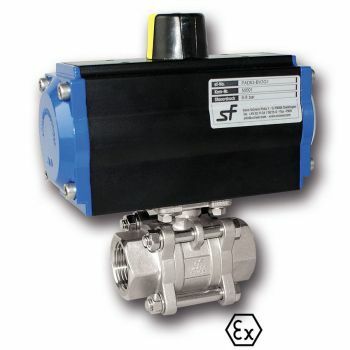 Ball valves with actuators have proven their value in many applications as very reliable and compact shut-off valves. Various types such as 2-way, 3-and 4-way ball valves in conjunction with various spherical bore sizes can be combined depending on the application and use. Ball valves provide fast and precise switching due to their simple structure. 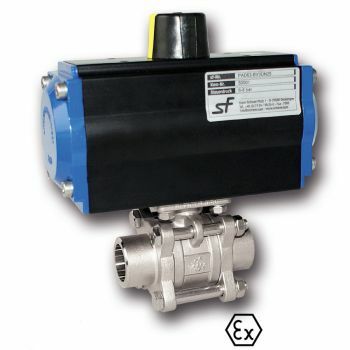 Ball valves with actuators offer a clean and cost effective solution especially for automation (electric or pneumatic actuators available) by direct mounting on DIN / ISO 5211- flange. Many process technology plants are generally driven by compressed air. This compressed air supplies the single acting pneumatic actuator with the necessary power to regulate the valve. This transfer of power has the effect of opening and closing of the ball-valve or the butterfly valve. BV3G: Stainless - Actuated 2-piece ball valve with paral.. Many process technology plants are generally driven by compressed air. 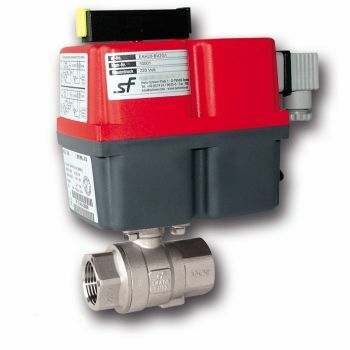 This compressed air supplies the double acting pneumatic actuator with the necessary power to regulate the valve. This transfer of power has the effect of opening and closing of the ball-valve or the butterfly valve. BV3G: Stainless - Actuated 2-piece ball valve with paral..
BV3DN type: Actuated 2-piece – stainless ball valve, with welding ends, according to DIN 3239th, overall length to DIN 3202 Part 2-S13; This pneumatically actuated ball valve has a control pressure at the actuator max. 6-8 bar. housing: AISI 316 (1.4408); ball: AISI 316 (1.4401); seal: PTFE / glass fibre 15%, O-ring: Viton a.. Many process technology plants are generally driven by compressed air. This compressed air supplies the pneumatic actuator with the necessary power to regulate the valve. This transfer of power has the effect of opening and closing of the ball-valve or the butterfly valve. BV3G: Stainless - Actuated 3-piece ball valve with parallel BSP thread..
A-EAL-BV3G is an electric actuated Stainless 3-piece ball valve of BV3G type – with BSP parallel thread to DIN / ISO 228. Overall length to DIN 3202 Part 4-M3; (exceptions: "**"). L (= 24V). This is a full bore ball valve suited for various applications offering reliability at an economical cost. This range of ball valve..
A-EAL-BV2G is an electric actuated Stainless 2-piece ball valve of BV3G type – with BSP parallel thread to DIN / ISO 228. Overall length to DIN 3202 Part 4-M3; (exceptions: "**"). L (= 24V). This is a full bore ball valve suited for various applications offering reliability at an economical cost. This range of ball valve..
A-EAL-BV3DN is an electric actuated Stainless 3-piece ball valve of BV3DN type – with welding ends as per DIN 3239th. Overall length to DIN 3202 Part 2-S13. 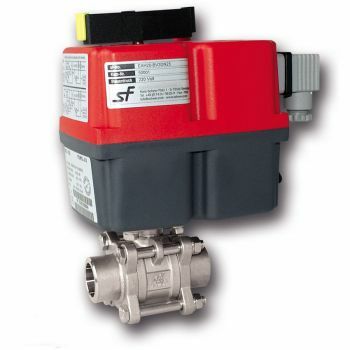 The actuator of this stainless ball valve is 24V. This is a full bore ball valve suited for various applications offering reliability at an economical cost. This ra..